There was a time when nail salons were strictly a woman’s domain, but those days are long over due to increasing demand from male clients and a growing number of businesses eager to serve them. Key to successfully serving men is creating a welcoming atmosphere and offering a menu of services geared especially for guys (think: male-specific grooming and gender-neutral decor). Ready to tap into this lucrative revenue stream? Follow this advice from industry experts and check out some of our product picks! If you want to attract male clients, create an environment where they’ll feel comfortable, experts agree. “Even though more male customers are visiting salons and spas, some still feel intimidated, or that going to a salon or spa is only for women,” says Vicki Malo, MBA, BSc Pod and president of the North American School of Podology. “It’s important to have an area where men will feel comfortable … with men’s magazines, maybe a TV playing sports—anything to make them feel at home during services.” Adds Katharin von Gavel, founder of Footlogix, “Provide a more private environment void of pretty ‘buff and polish’ posters and women’s fashion magazines.” Alpha Male Nail Care in Charlotte, North Carolina, which caters specifically to men, offers such extras as a complimentary whiskey or vodka cocktail with each service and provides an option for extra privacy, while Tenoverten salons, with locations in New York; Los Angeles; and Austin, Texas, appeals to both male and female clients with an androgynous aesthetic and iPads that allow customers to peruse the content that interests them during services. When it comes to working with male clients, education is key to putting them at ease, according to Tenoverten cofounders Adair Ilyinski and Nadine Abramcyk. “We find that men like when each step is briefly explained to them, especially if it’s their first nail salon visit,” says Ilyinski. “That way, even if they aren’t as familiar with the routine, they’re made to feel comfortable about the process and the reason behind each step.” This in particular is why it’s imperative to use correct terminology when tending to men. When designing nail services for men, consider their specific concerns, taking into consideration that for many men, time is money. “Tailor your menu to address the needs of your male clientele and timing associated with each service,” says Nikki Fraser, Footlogix educator and business development specialist. 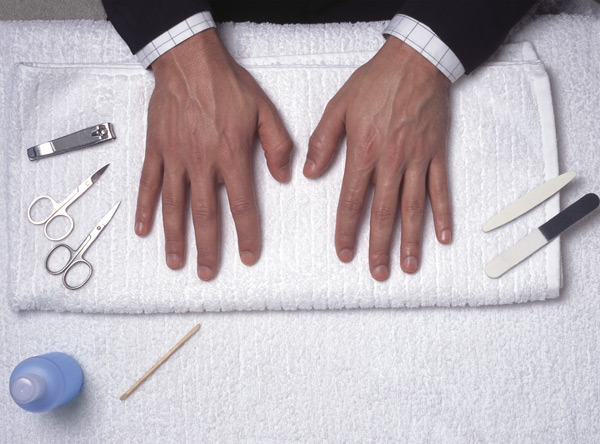 Bayarmaa Ekhtavian, a nail tech at the mens-only Grooming Lounge, which has locations in Washington, D.C., and McLean, Virginia, stresses that men’s hands and feet can have various issues that need attention during services, such as rough calluses. “Men typically wait too long between services,” she says. Offering a callus remover as an add-on or as part of the service will benefit both tech and client. “Men, for the most part, have great feet, since they don’t wear sandals and heels like women,” says Letrice Lopez, nail technician and owner of L.A. Spa on the Go, a mobile nail salon serving the Los Angeles area. “But they do have issues. One of them is sweaty feet that can lead to athlete’s foot. I recommend regular pedicures and give them creams and sprays to help between services.” Ekhtavian often sees ingrown nails and tension, as well. “We gently remove [the ingrown part of the nail] and structure the nail as part of our ingrown nail treatment,” she says. “To address tension, we include reflexology and massages to relieve pressure and increase blood flow.” In addition to service considerations, make sure you have the right products on hand when working with male clients—and don’t use any scents that are too feminine. Ilyinski and Abramcyk make sure to stock nail files with a lower grit, for example. “Men typically have thicker nails than women,” says Abramcyk. While men’s services often offer basic nail care and grooming, it’s important not to skimp on the massage. “I usually give men a longer massage since they don’t get polish,” says Lopez. 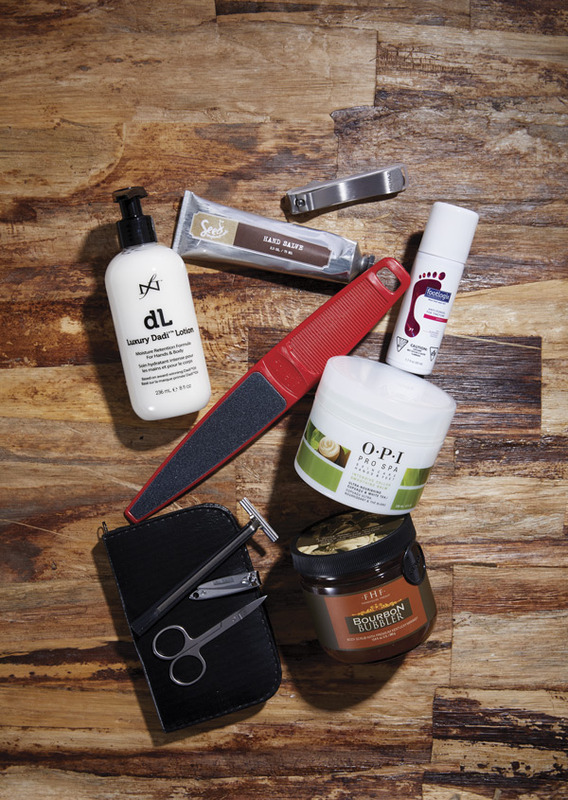 “As a finisher, instead of polish I’ll add a special foot cream or balm that caters to their needs or a matte top coat for the guys who are daring.” While many men opt for simple, speedy nail services, others may be looking for a little more TLC, so providing a few different menu options can be beneficial. Alpha Male’s The Alpha Male: Athlete treats workout-weary guys to reflexology, a golf ball massage, hot towels and in-depth callus care, while Grooming Lounge’s Signature Nail and Foot Treatment provides a spa-like experience with exfoliation, an extended massage, a hand mask and a hot paraffin wax treatment—a hit with guys who crave a little more time to relax and unwind. Savvy services like these, along with a male-friendly atmosphere, will have your men’s business booming, too. 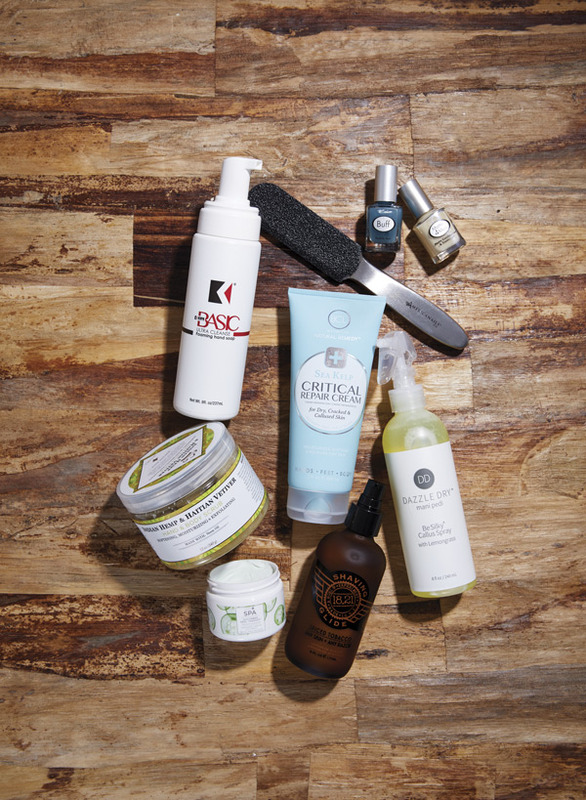 Repair Shop: Keep guys’ hands and feet in mint condition with this carefully curated selection of professional and retail products.